To tweet, or not to tweet, that is the question. According to a study from McMaster University, academic thoracic surgeons who are already on Twitter should choose to share their research in 280 characters if they are looking to get noticed. A team of researchers at the university found that the more you tweet, the better your research citation index. An abstract of the study results was shared during a recent poster session at the Society of Thoracic Surgeon’s Annual Meeting in San Diego. The h-index, formally known as the Hirsch-index, is a common metric used to evaluate a researcher’s productivity and influence. More than 3,700 thoracic surgeons registered on CTSnet.org in Canada and the United States were queried for profiles with an h-index on Google Scholar and/or ResearchGate in July 2018. Of the 722 surgeons found with an h-index, 188 were on Twitter, while the remainder of the 534 were not. The research team focused on the 95 per cent, or 686, on ResearchGate. Based on the 686 surgeons, the mean h-index for the entire cohort was 14.54. The median h-index was 10 and the 75th percentile h-index was 20. The mean for surgeons on Twitter was 15.02, compared to 14.86 for surgeons not on Twitter. The 75th percentile h-index was 23, compared to 20, respectively for these two groups. Researchers summarized that the Twitter usage of North American thoracic surgeons showed no significant difference in h-index values between those who use Twitter versus those who do not. However, they also concluded that among surgeons who use Twitter, those who tweet more frequently, follow more people, and have a greater following are more likely to have their research cited by others, and consequently have a higher h-index than their counterparts. The study with more extensive data has been submitted for publication. Hanna noted that while the study provides scientific impact, there are still outstanding questions that he hopes others will look to answer. Regardless, Hanna said the study has made an impact on his own digital footprint. 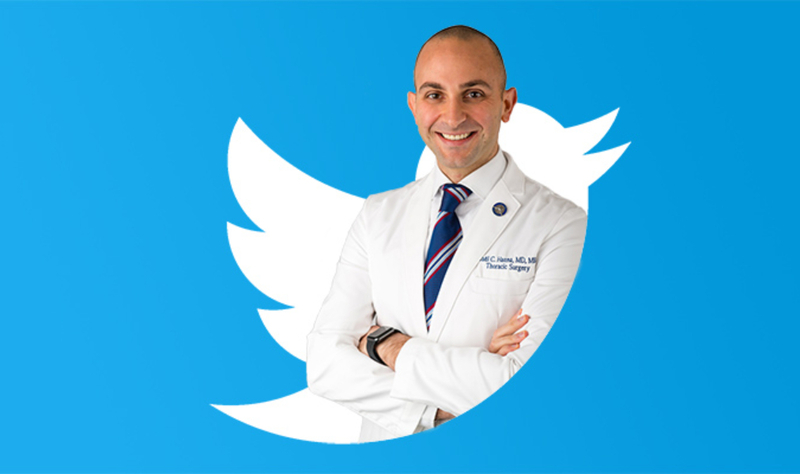 He said that he anticipates that social media, and Twitter, in particular, will become increasingly used by thoracic surgeons to communicate with current and prospective patients in the coming years. All researchers on the study came from the Division of Thoracic Surgery in the Department of Surgery at McMaster. You can connect with McMaster’s division of Thoracic Surgery at @MacThoracics. There was no external funding for the study. Poster details for the study are available on page 224 of the abstract book here.